SAN FRANCISCO, April 6, 2016 - House Beautiful’s Kitchen of the Year—the must-see destination for state-of-the-art kitchen design and innovative culinary happenings—is returning to San Francisco to celebrate its tenth year and will be open to the public from Saturday, April 29, through Monday, May 29, at the 2017 San Francisco Decorator Showcase (2698 Pacific Avenue). This year’s Kitchen is being designed by Jon de la Cruz of San Francisco’s DLC-ID, who will bring his expert ability for creating modern, timeless and inventive interiors to the showcase. His design will honor a love of food and entertaining, and celebrates the kitchen as the new American living room. The 2017 San Francisco Decorator Showcase belongs to a large family with eight school-aged children, including two sets of twins, so de la Cruz will create a kitchen that accommodates their busy lifestyle. Case in point: de la Cruz is using Thermador’s 60” Combination Steam Oven (the largest in the market) as well as debuting Thermador’s new 36” wide refrigerator and freezer columns, perfect for this extra-large family. Known for creating fresh, impressive interiors that are truly unique to each client, de la Cruz will incorporate novel ideas for the kitchen and the entire family. The kitchen is to feature a dramatic three-part design, integrating a main breakfast area, a baking area, and a scullery. An adjacent mail/mudroom and dining area are also incorporated into the kitchen design. De la Cruz elevates the project to much more than a simple kitchen renovation by drawing inspiration from his work over the past 20 years working with the Bay Area’s top design firms, successfully leading projects for buildings including The Battery SF, The Cavalier, Marlowe, Carbone in Las Vegas, Sadelle’s in New York, and private residences around the country. Thermador appliances is returning to Kitchen of the Year, having made their debut last year at KOTY in Atlanta; Caesarstone returns for the tenth time, having been the countertop sponsor from the very start in 2008. Corbett Lighting, DXV by American Standard, Farrow & Ball, Ferguson Bath, Kitchen & Lighting Gallery, GROHE, Grothouse, Hudson Valley Lighting, Kate Spade New York, Lee Industries, Lenox, Leviton, Matthew Quinn Collection, The Mine, Troy Lighting, and Woodard are all returning sponsors as well. New this year are Blisshaus pantry products, Fireclay Tile, Haussmann Stone, and JWH Design & Cabinetry. The Kitchen of the Year, located inside the San Francisco Decorator Showcase at 2698 Pacific Avenue, will be open to the public from April 29 – May 29. Tickets are $40 for general admission, $35 for seniors, and are available at the door or online at www.decoratorshowcase.org/tickets. For the past 38 years, the annual San Francisco Decorator Showcase has benefited San Francisco University High School's financial aid program, raising over $15 million and benefiting hundreds of students. For design enthusiasts outside of the Bay Area, the project will be featured in the October 2017 issue of House Beautiful, on newsstands September 19. For more information about House Beautiful’s Kitchen of the Year, visit housebeautiful.com/KOTY or follow the hashtag #HBKOTY on Instagram and Twitter. 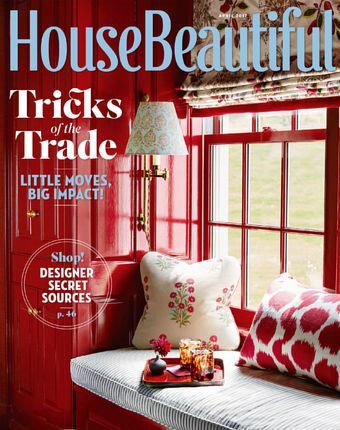 House Beautiful, published by Hearst Magazines, is the leading authority on American decorating and design, with an audience of 8 million (MPA January 2017). Since 1896, House Beautiful has inspired readers to believe that from a beautiful home comes a beautiful life. With alluring photography, candid conversations with top designers and original decorating ideas, House Beautiful invites readers to dream and do. Follow @housebeautiful on Facebook, Instagram, Pinterest and Twitter. Hearst Magazines, a unit of Hearst, is one of the nation’s largest diversified media and information companies. Hearst Magazines’ print and digital assets collectively reach more than 128 million readers and site visitors each month, or 53 percent of all adults in the U.S.; nearly two-thirds of all women and 69 percent of all millennial women. (source: comScore/MRI 9-16/S16).